The Baby room caters for up to 12 babies from 6 months old. It has a separate sleep room, milk preparation kitchen and secure nappy changing facilities. Each baby’s day is flexible, different and parent led. We are happy to feed your baby expressed milk or formula supplied by you. Feeding and sleeping are gently worked into a routine which suits each baby’s individual needs. 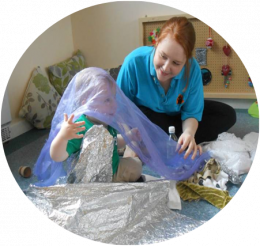 The babies benefit from a wide range of daily activities, indoors and outdoors, which includes socialising with other children and familiar adults, listening and joining in with conversations and songs. There is plenty of space for physical play to kick and stretch, crawl and walk safely, and toys specially chosen to encourage movement. Mobiles, books and interesting new objects are used to provide visual stimulation. 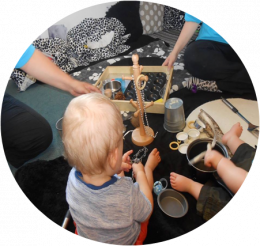 Treasure baskets, water and other materials are used for creative play to develop tactile senses. 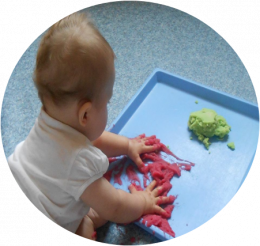 Manipulative skills, such as holding, squeezing, rattling, turning and throwing, are developed and with fresh air combines to make a typical day in the baby room. Of course, the focus on each baby’s development in no way prevents the all important cuddles, love and fun!